The BBC, UK Met Office and UN IPCC had to acknowledge that global temperatures have at least for the time being decoupled from the CO2 rise and levelled off or fallen (6-7 years). 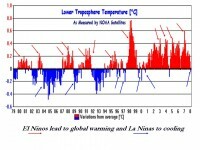 They are blaming the cooling on La Nina. They are of course correct, La Ninas global cooling just as El Ninos brings global warming. It must have pained them to do so as they have previously discussed these factors as being secondary to greenhouse gases and with impacts that were mainly regional in nature. 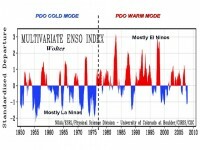 The PDO warm phase from 1977 to 1997 was dominated by mostly El Ninos (see why here) and since they correlate with warmer global mean temperatures, it is not surprising global temperatures rose. Alarmists blamed greenhouse gases but it was likely the PDO and the Grand Maximum of the longer term solar cycles. The prior three decades had mainly La Ninas with cold temperatures like this year in more years than not and solar cycle 20 which peaked around 1970 was relatively weak and longer in length. Not surprisingly global temperatures declined. 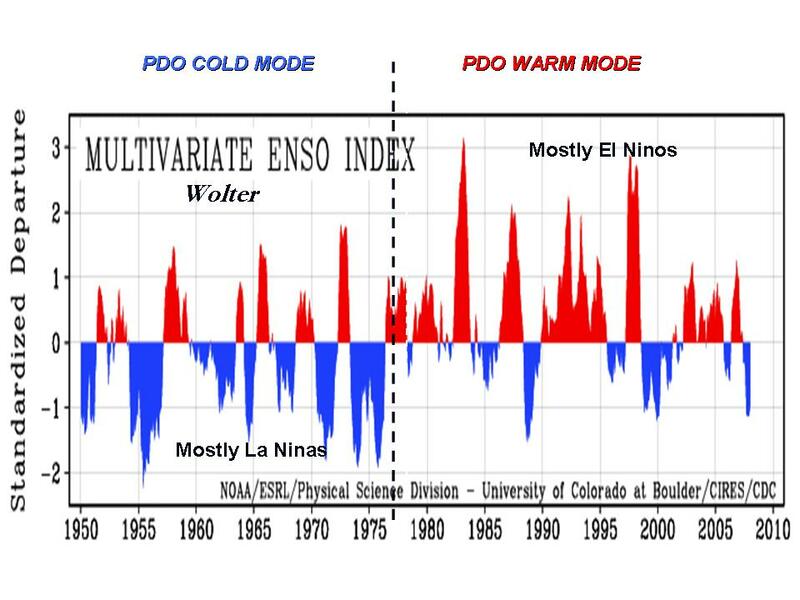 Then with the Great Pacific Climate Shift in 1977, the Pacific warmed and PDO turned positive. El Ninos dominated. 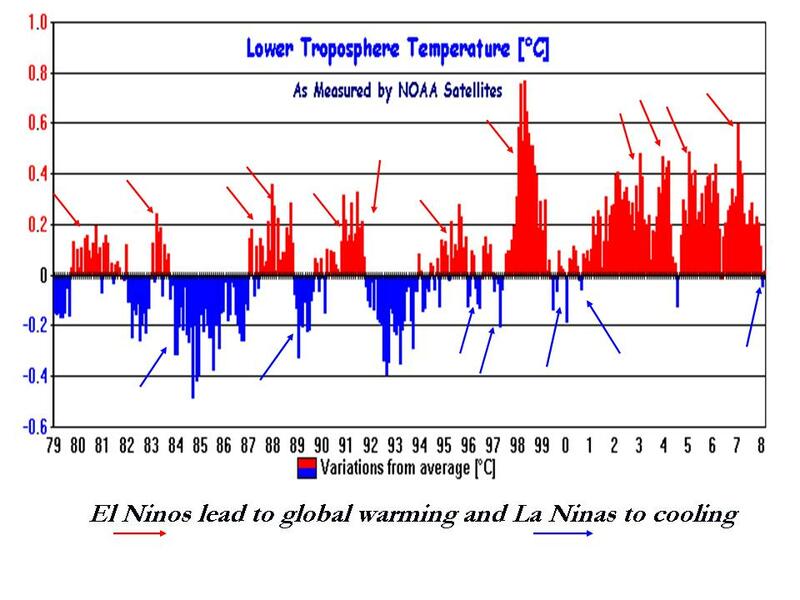 You can see how the El Ninos in the satellite era since 1979 have been associated with global warmth. The PDO and the Atlantic Multidecadal Oscillation (AMO) have also been implicated in drought probabilities in an excellent paper done by Gregory J. McCabe, Michael A. Palecki, and Julio L. Betancourt in 2004. They found More than half (52%) of the spatial and temporal variance in multidecadal drought frequency over the conterminous United States is attributable to the Pacific Decadal Oscillation (PDO) and the Atlantic Multidecadal Oscillation (AMO). Recent droughts with broad impacts over the conterminous U.S. (1996, 1999-2002) were associated with North Atlantic warming (positive AMO) and northeastern and tropical Pacific cooling (negative PDO) (the bottom right map in the figure below). That is the case this summer.